Summit Advisory is proud to partner with The High Center to serve and strengthen family businesses. In addition, Summit Advisory is a Silver Sponsor for the April 16, 2019 Family Business Forum. This forum will feature keynote speaker, Alan Mulally, former President and CEO of The Ford Motor Company and The Boeing Company. Throughout his career, Mulally has been recognized for his contributions, industry leadership, and service, including being named #3 on FORTUNE’s “World’s Greatest Leaders”, one of the 30 “World’s Best CEO’s” by Barrons’ magazine, one of “The World’s Most Influential People” by TIME magazine and “Chief Executive of the Year” by Chief Executive magazine. The forum is the only High Center Event that is open to the public. You can find tickets and register here. The S. Dale High Center for Family Business is a group of family business owners dedicated to offering the best available resources to families in businesses. The High Center is one of the largest and oldest centers in the country. Investors are aggressively seeking businesses to acquire. If you receive an unsolicited offer to buy your company, we strongly urge you NOT to accept it for a variety or reasons. The number that seems “fair” at the beginning never goes up, but almost always goes down. Preparing for a successful transaction requires a great deal of work and planning. You need an experienced team to run the process so you can keep running your company. If you enter negotiations with only one party, you will have no leverage or alternatives. It’s impossible to negotiate the best terms under these circumstances. Your business is likely your most valuable asset. When you sell it, you and your team should be the ones to define the process and set the terms. If you accept an offer that you weren’t expecting, the buyer is in the driver’s seat. Summit Advisory is an Investment Banking Firm that has been helping Middle-Market business owners to achieve great results since 1989. We have a success rate of over 90% in helping our clients achieve their goals in transactions. We’re Different. Our team of highly skilled professionals will follow a disciplined and time-tested process to preserve confidentiality, keep you in the driver’s seat, and deliver the best possible results. Most business owners do not prepare to exit their business before there is an immediate need and then feel rushed to make a decision. A recent Summit client was in conversation with us and kept extending his decision and his timeline. He ended up having unexpected serious health issues that caused his passing before he could get an exit strategy in place. This left his wife and children with the burden of the business and the decisions surrounding it. Summit encounters similar circumstances a few times a year. Our best advice to all business owners is to have a plan in place before the need arises. 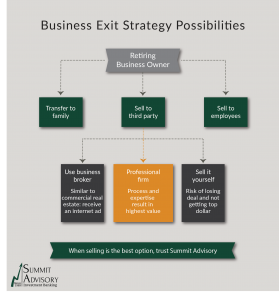 Summit Advisory uses a proprietary process to ensure our clients' have a successful transaction.